The full line up of live band footage is up on Girls Rock's YouTube Channel. Check out the next gen of rockin' grrrrrls right HERE. We're still outta town, with ChiIL Mama's show footage yet to come. For now, though, check out the flip cam footage from the front lines. There's some great stuff. They caught another fun angle on Octopie's Bloody Unicorn song and were close enough to open with Sagezilla rockin' the guitar, lying on the floor of the stage. Both 8yo. guitar players in the band are gymnasts in training for level 4 competitions and they ended the song by both going into the splits. We had a sea of head in front of us and missed the gymnastic finale-the kids just dropped out of sight. I'm still looking for someone who caught it. 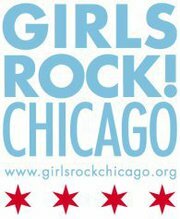 There's one more week of Girls Rock Camp coming in August, with a whole new batch of campers ready to rock. All in the family. Deborah's daughter, Violet, has been going to GR!C for years and she's in the band, When Flying Feels Like Falling, one of ChiIL Mama's featured bands for July. But you won't just see her Mom in the audience or schlepping gear for the kids. She rocks, too! 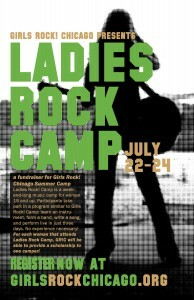 Ladies Rock Camp is a fundraiser for Girls Rock! Chicago. At this intensive weekend-long workshop, women ages 19-99 will follow a program similar to what the girls do at our summer camp: learn an instrument, form a band, write a song, and perform it - in just three days. If you are one of the many women who has thought, “I wish Girls Rock! Chicago was around when I was a kid!” this is for YOU. Each applicant will choose to play guitar, bass, or drums as her main instrument for the weekend. We assign instruments on a first come, first serve basis, so please provide us with a second choice instrument…NO MUSICAL EXPERIENCE IS NECESSARY. You can view the 2010 Ladies Rock Camp Schedule here. GREAT NEWS! 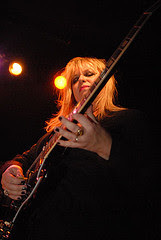 Ladies Rock Camp now offers Sliding Scale Tuition! Basic enrollment fees help subsidize scholarships for Girls Rock! campers who qualify for financial aid, so the more you’re able to give, the more campers you’ll help!